The Little Chute Lock was opened for navigation in 1856. It was rebuilt between 1880 and 1890, and rebuilt in 2005. Additional levee work was completed in 2008. It is constructed of quarry stone with concrete caps and wooden gates. It is located at mile 26.4 and it lifts 13.6 feet. The Lower Fox drops 180 feet between the head of the river in Lake Winnebago and the mouth at Green Bay. The rapids is what attracted millers and paper makers to the Fox River Valley. Eventually, the Lower Fox River was dammed to take advantage of the potential energy. The canal at Portage, between the Fox and Wisconsin Rivers, closed in 1951. The locks in the Upper Fox then fell into disuse. In the 1970s, the locks on the Lower Fox were falling into disuse and disrepair. 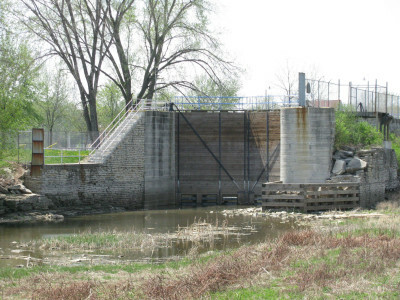 The locks were closed in 1983 and in 1988, the lock at Rapide Croche was sealed to prevent Aquatic Invasive Species (AIS) from entering the Lake Winnebago ecosystem. Ownership and operation of the locks on the Lower Fox were transferred from the U.S. Army Corps of Engineers to the State of Wisconsin in 2004, although the COE continues to operate the dams. Under the guidance of the Fox River Navigational System Authority, the locks on the Lower Fox are being restored and returned to operational status. Some are in use now, and eventually, recreational mariners should be able to navigate the Fox River from Rapide Croche to Lake Winnebago by 2017.